Summertime means different things in different parts of the country. In my Toronto neighbourhood, it’s the start of the backyard movie season. For more than a decade, I’ve set aside a handful of summer weekends, weather permitting, and projected videos onto a 4×8 white vinyl sheet I bought for $20 at Home Depot. The still-booming sound comes courtesy of a refurbished 5.1 SurroundSound system purchased at a now-defunct factory outlet store. (Look for quick and easy do-it-yourself outdoor movie tips at the bottom of this column). Features have ranged from the Marx Brothers to Bogie & Bacall to Dr. Strangelove to The Godfather to Avatar. I often open with videos of old TV series like Green Acres, The Beverly Hillbillies, Bewitched and Get Smart. But there’s another trend of defunctness that may affect my backyard programming — the stunningly quick demise of video stores, and the DVD/BluRay format itself. Cluelessly, I sent out emails to neighbours and friends announcing that this year’s debut movie would be The Death Of Stalin, the funniest movie of the year, in my opinion. Starring Steve Buscemi as (of all people) Nikita Khrushchev, it’s from the hilarious satirist Armando Iannucci, who gave us the movie In The Loop (taken from the British political sitcom The Thick Of It), as well as the Julia Louis-Dreyfus series Veep. The movie was announced as available on home video. What I’d failed to take into account, however, was that it would be “out” at the only two video stores of note in Canada’s largest city. Yes, that’s right. Notwithstanding some “adult” video establishments, Bay Video and Queen Video are the only choices for good old-fashioned video rentals I could find in central Toronto. Until two years ago, there was a neighbourhood place called The Film Buff that had every classic movie I could think of. It was the content provider for most of my backyard movie experiences. And then it was gone. For those keeping score, in 2000, there were nearly 30,000 video stores in North America. There are now fewer than 2,000. Your city may have one. Or it may have none at all. Which is not to say that the few stores left open aren’t doing good business. I played my two options all week for The Death of Stalin. Bay Video gave you the option of buying, but it was sold out of sale copies. And they didn’t let you reserve the rentals. You showed up or phoned and took your chances. One morning, I phoned 20 minutes after it opened and a single copy had been returned and already rented again. At Queen Video, they promised to phone me if it showed up. I phoned one morning to find that the promise had been empty. “I’ve got it, but it’s already reserved,” the manager said. “That would be me,” I told him. “Is your name Lorenzo?” he replied. After some pleading on my part, the manager concluded that I probably wasn’t lying about being first in line, and anyway, Lorenzo wasn’t there. Get down here and you can have it. Crisis averted, for $4.99 plus tax. The day after a humid night of movie-watching under the stars, I fulfilled the old tradition of showing up at a shuttered video store and slipping my DVD into the return slot. The irony is that this tradition of mine started because of DVDs. When I was employed at a daily paper, I’d be responsible for covering 25 or so Toronto International Film Festival movies yearly, with interviews. To get a jump, movie publicists would often send me DVD “screeners” in August. By the time the Labour Day weekend rolled around, there were usually several I hadn’t had time to screen yet. And not wanting to spend the holiday weekend indoors, I came up with my own weekend-long film festival. I’d sweet-talk one of the executive assistants into signing out a digital projector from the company’s A/V department (this was when they were running at about $2,000), and experiment with my set-up. Soon neighbours were checking out the self-created “event” with me, bringing drinks and popcorn. TIFF probably wouldn’t have appreciated their festival programming getting an early pirate screening, but I know for a fact I generated ticket sales for them (more than one of my friends opted to see a particular movie again). Eventually, I bought a used projector for $200 from a colleague at another paper, who preferred using a projector in his living room to flat-screen TV. A few years ago, I got a Groupon deal on an HD projector for about $300. And now? The way things are going, I may have to join the wireless society. I have a connection for my laptop to the projector, and have used WiFi — notably to stream CBC’s farewell concert of the Tragically Hip in my backyard for a record crowd of about 25. The signal reaches, though there is some buffering if the picture is HD. So, I won’t be in a total lurch if my movies, in future, have to come from iTunes or other online services. But I believe I may be the last of the “hard copy” generation. My music, digital as it may be, is on external hard drives. My son, meanwhile, streams all his music on Spotify. I feel the need to hold my movies and music in my hand. He’s of the generation that believes that’s what the cloud is for. I even get mocked for the fact that my speakers still have wires. But so long as there exists even a single video rental store, I will be there. Purchase a foldout 10×10 camping gazebo, Coleman or other brand. You can still get them for less than $100. Find a screen. As I say, a 4×8 piece of white vinyl at a building materials store ($20-$30) does the trick nicely. Neatly poke holes in the corners and the top. Use bungees to affix the screen, via the holes, to the rear of the gazebo. Find a speaker system, any kind, so long as there’s an RCA (red and white) audio input. Buy a BluRay player. You’d be surprised how cheaply they go for now – as little as $40 refurbished. Buy a digital projector. This is invariably your biggest expense. The high-end ones can still run more than $1,000. But I purchased a perfectly good HD projector for $300 online. Wait for the sun to set. Sit back and enjoy the show. For those without a backyard, outdoor movies are still a “thing” across Canada. In the Greater Toronto Area, scores of city parks host movie nights, as well as major gathering areas like Mel Lastman Square, Yonge-Dundas Square, Celebration Square in Mississauga, Brampton’s Mount Pleasant Village Square, Chinguacousy Park and Garden Square and Sir John A. Macdonald Plaza (outside Union Station). As well, the Toronto International Film Festival usually includes free outdoor screenings on Festival Street (the closed off King Street) during its run in early September. Vancouver’s Academic Quadrangle hosts a free outdoor screening of Shrek, Friday, July 18, while the Queen Elizabeth Theatre plaza has outdoor screenings of Coco (July 18), Singin’ in the Rain (July 25), The Three Amigos (Aug. 1) and Wonder Woman (Aug. 8). 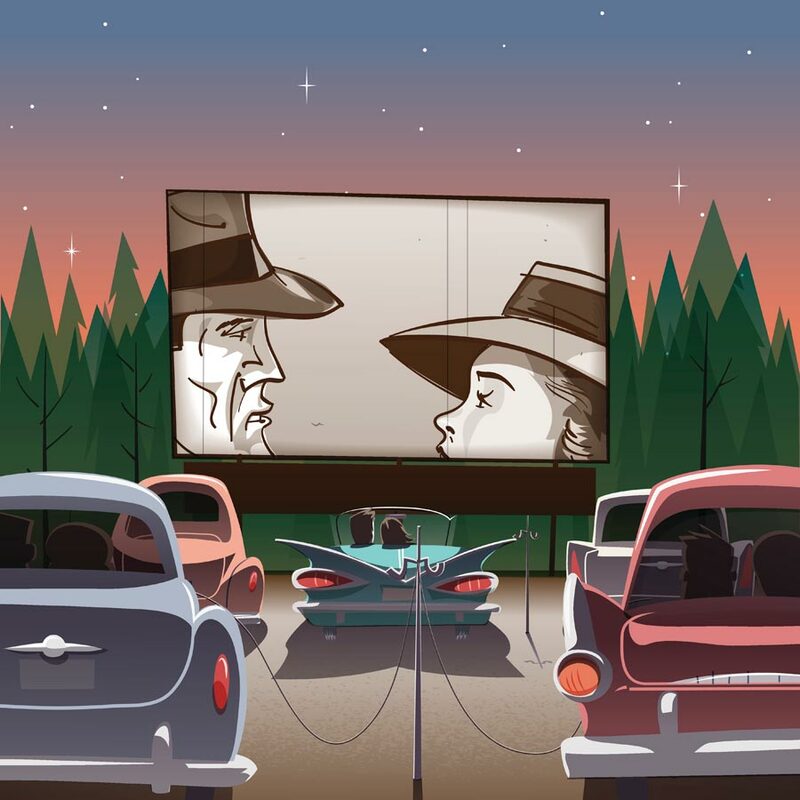 Montreal’s open-air movie scene is thriving, with full programs at Cinema sous les etoiles, Cinema urbain a la belle etoile, Cinema-Parc Dante, Film noir au canal and NDG Off the Wall among others. 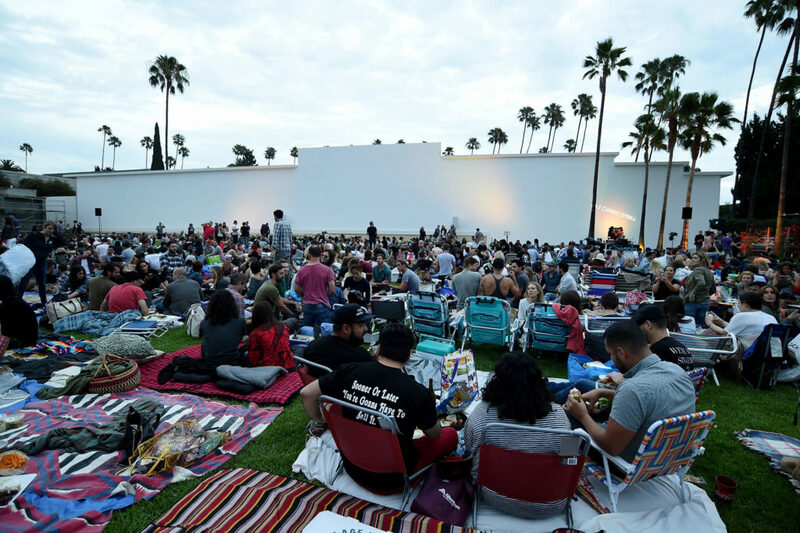 And one of the most famous outdoor movie experiences in the world is at Los Angeles’s Hollywood Forever Cemetery (pictured above), attracting legions of film buffs with food, drink, folding chairs and blankets in hand. Films in its lineup this year include Almost Famous, Casablanca and The Neverending Story.